Michael Jackson's passing yesterday brings reminiscing by the rich and famous who had contact with him over his life. While I was by no means a friend or even an acquaintance, I have my stories as well (although neither rich nor famous). When I first moved to LA in 1980 I took a job as a salesman at the audio gear supplier Everything Audio to put food on the table until a reasonable touring or studio job popped up. The company was based in Encino, California, the same town where the Jackson family had their compound. As a result, all the Jackson brothers used to come to the office (we were located high up in an office building with only a small showroom) at various times to purchase gear. On 3 or 4 occasions, Michael Jackson dropped buy to place an order. At the time, Michael Jackson was famous, but he wasn't "Michael Jackson the superstar." He was a nice enough guy who'd slip into and out of the office quietly. We'd say hello, and I'd pass him off to his personal salesman. He was quiet, unassuming and taller than I'd thought he'd be. he never said much but always had a smile on his face. Eventually I became the sales guy to brothers Marlon and Randy, and was invited up to the Jackson compound a few times. I remember that the thing that impressed me the most at the time was one of their guest houses that was decked out completely for video gaming, having every video game kiosk of the time that you can think of (they were a bit ahead of their time on this - it was 1981). By this time, Michael had moved off compound to his own estate a block away. The next time I saw Michael was in 1982 before Thriller had come out. He was a much bigger star now, and had to go out incognito. I remember coming out of the now defunct Wally Heider studio on Sunset Blvd. at about 8PM one night, and as I stood on a corner waiting for my ride, an old beat-up 60's Chevy Camaro with primer, no paint and lots of bondo passed me by. Something made me take a good look at the driver (the window was open) and sure enough, it was Michael. The car passed quickly and although I thought I saw him, I couldn't be sure. But then it passed again, and again, and yes, it was Michael circling the block for some reason. My ride showed up by this time, so I packed my gear in the trunk and left. Who knows how many times he passed by, but it was Michael Jackson, driving himself around in a beat up car. My next encounter with MJ from a distance was almost life changing. I was writing songs with Michael "Shrimp" Chambers, a famous break dancer at the time and the guy that taught Michael Jackson how to moon walk. We wrote what we thought was a great ballad, and Shrimp said, "I've just got to get this to Michael. I know he'll love it." This was after Thriller and Michael J. was a full-fledged superstar and had now moved to Neverland. Sure enough, Shrimp was invited to the ranch to play the song for Michael and much to our shock and excitement, he did indeed love the song, proclaiming it "a hit." "Here we go," I thought, "the step into the really big time. 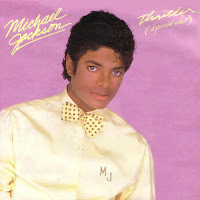 If Michael cuts this on his next album, it could be worth major $$$$!!!" A few days later Michael called back and said, "Shrimp, I really think this song is a hit, but you should cut it instead of me. I want you to be successful." Now Michael could have offered to produce it, or introduced us to any number of people that could've helped us, but he didn't. And Shrimp didn't have a record deal so keeping the song for himself was moot. MJ might've been distracted with life or he might've been letting us down easy, I never found out the back story. The song got cut by a Motown artist no one has ever heard of before or since, and we made zero $$$. What a swing of fortune! But it doesn't stop there in terms of my being a degree separated from the man. In the early 90's I took Jennifer Battan's place as guitar player in a version of the cult band Doc Tari. Jennifer left to become MJ's touring lead guitar player. Then in the late 90's, I met and became friends with Bruce Swedien, the engineer that crafted all of Michael's big selling records and an absolute superstar in his own right in the recording community. In fact, he was kind enough to sit for an interview for my first book, The Mixing Engineer's Handbook. Then in 2004, I produced a video interview with producer Quincy Jones at his magnificent house in Bel Air. Since I was such a fan of their work and interested in the recording background of Michael's albums, both of these larger than life people were kind enough to relate all sorts of great MJ studio stories, not one disparaging Michael in any way (though I did hear lots of "unusual" stories from other people). I'm one of those that doesn't really believe that you die as much as transition into something different. As your journey ends in this world, universe, dimension or whatever else you want to call it, another begins. Happy journey, Michael Jackson. I was recently given a mix to evaluate and as I listened, it soon became apparent that the mixer wasn't aware of the "magic frequencies." Magic EQ frequencies are something that every mixer should know in order to obtain the biggest, best sounding mix. "• Sub-Bass - The very low bass between 16 and 60Hz which encompasses sounds which are often felt more than heard, such as thunder in the distance. These frequencies give the music a sense of power even if they occur infrequently. Too much emphasis on this range makes the music sound muddy. For those of you who have an easier time visualizing the audio spectrum in one octave increments (like those found on a graphic equalizer), here’s an octave look at the same chart. 8kHz = sibilence, definition, "ouch"
This last list is really helpful for neophytes (pros too) when EQing. We can extend the magic EQ frequencies to specific instruments and really zero in on the particular bands that make that instrument speak, but the list above is a good start and easy way to remember. LA session bassist Paul Ill and I recently completed a new book called The Studio Musician's Handbook. In it we cover all the things that you need to know to become a studio musician, including things like the different types of sessions you might play on, what equipment you need, what kind of chops are required, how much you can make and who hires session musicians. Also covered is something very important but always overlooked when discussing session players, which is the proper studio etiquette that all top studio musician's must have in order to keep working. The book also contains individual players guides for just about every instrument (including strings, horns and percussion), as well as 14 interviews with top players like Ricky Lawson, Leland Sklar, Rami Jaffee and Brian MacLeod. There's a DVD that accompanies the book and it contains a few more interviews as well as a look into a session at a top Hollywood studio. A sample of the DVD is included in the trailer below. 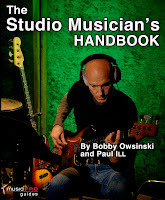 The Studio Musician's Handbook is published by Hal Leonard and won't be available until October, but a table of contents and some sample chapters and interviews are available on the bobbyowsinski.com website right now. Below is the trailer for the book. Before drums can sound good under the microphones, they have to sound great acoustically first. In a summary of Chapter 1 of The Drum Recording Handbook that engineer Dennis Moody and I wrote, we find out just why drums acoustically sound the way they do. So what does sounding “great” actually mean? While the definition of great is different to different people on a general level, in the studio it usually means a kit that is well-tuned and free of buzzes and sympathetic vibrations. This means that when you hit the a rack tom, for instance, the snare doesn’t buzz and the other toms don’t ring along with it. Or if you hit the snare, the toms don’t ring along. So how do you achieve this drum nirvana? It’s all in the tuning and the kit maintenance. But so many drummers just buy a set of drums because they look good or because their favorite drummer endorses them without really listening first. Unfortunately, many drummers aren’t even aware of what they should be looking for. So lets take a look at drum construction itself, since it helps to have a little background so that you can determine just what your drum kit is capable of and why it sounds the way it does. There are a number of parameters that determine what a drum will sound like. Let’s take a look at them. The diameter of a drum has the most impact on the natural pitch of a drum. The larger the diameter, the lower the natural pitch, although you can obviously change this a bit by tuning the heads. While the shell depth does contribute to the tone a little, it’s mostly responsible for how loud the drum will be and to some degree, the articulation of the sound. This means that a shallow shell (say a 9” tom) doesn’t have as much surface area as a larger one, so the sound is a bit shorter with a sharper attack. A drum with a deeper depth (like a 12” tom) will have a lower resonant frequency so the attack will be a bit longer and warmer and the drum will be louder. Shell thickness is usually overlooked as a contributing factor to the sound of a drum. Thinner shells actually are more resonant since they’re easier to excite because they have a lower mass than a heavier, thicker shell. As a result, thicker shells have to rely much more on the heads for the overall tone of the drum. Probably out of all the parameters described here, the material used to make the drum shell is the most responsible for tone of the drums. Here are the most commonly found drum shell materials. Generally speaking, maple is the most prized construction material by drummers, primarily because the sound is so even across the drum frequency spectrum. It’s expensive and becoming more difficult to get since it’s a slow growth tree. Mahogany is another slow growth wood that is becoming increasingly hard to find. While true US or Honduran mahogany is considered the best, other woods from the Philippines, Southeast Asia, China and Malaysia are sometimes labeled mahogany simply because they have the same look as the US or Honduran wood, but they don’t sound the same since their density varies from the real wood. Mahogany drums sound warmer than maple since the low end is increased. Birch is a very dense wood, which, thanks to its hardness, results in a brighter drum with a lot less low end than Maple. Poplar is a fast growing tree, which translates into cheaper wood and inexpensive drum kits. It has a sound very similar to birch, with a bright top end with less bottom. Basswood is also a fast growing tree, resulting in inexpensive kits, but exhibits an increased low end that’s similar to mahogany. Luaan is an Asian tree that provides the least expensive wood available. It’s very strong and accepts a stain very well so it generally looks good. It also has a warmer sound with less top end, similar to mahogany. Although it’s not widely known, the interior of the drum shell has a lot to do with the pitch of the drum. A rough interior produces in a less resonant drum, since the roughness breaks up the interior reflections. A smooth interior results in a more resonant drum, which means it’s easier to tune and control. Maybe the least understood of all the things that go into giving a drum its tone is the bearing edges of the shell. That means the cut at the edge of a drum shell where the hoops are attached. The way the bearing edge is cut can not only affect the pitch of the drum, but the tuning as well. The sharper the cut, the brighter the drum. The degree at which the edge is cut makes all the difference in the sound of the drum. A sharp 45º angled cut will result in a long sustain with bright overtones. A 30º cut will provide less of a high-pitched ring. Rounded edges produce a muted, poor tone. All bearing edges must be flat and true with the exact same degree of cut. For more on bearing edges, see the tips from the Drum Doctor later in this chapter. The type of hoop and the number of lugs used to seat the drum heads also determines how the drum will sound. In general, the thicker the hoop, the easier the drum will be to tune. Fewer lugs provide more complex overtones. Stamped hoops are made from a variety of metals, all of which affect the tone a bit differently, but most drummers feel they get a warmer tone from die cast hoops. Aluminum gives a high pitch while brass provides more overtones. Die cast hoops are generally both thicker and stronger than stamped hoops so the drum becomes easier to tune. There are fewer overtones as a by-product. Wood hoops come in different thicknesses, so they can be made to sound like either a stamped or a cast hoop, only brighter. Drum construction plays a vital importance in how a drum will sound, and until it sounds great acoustically, it will never sound great under a microphone. I've been a proponent of the Performance Rights Act as you know if you've been following this blog, since I'm a strong believer that artists should be paid for what they do. That being said, I do have an open mind, and the very informative Creative Deconstruction blog has a great article entitled, "5 Reasons Why The Performance Rights Act Is A Bad Idea." These are compelling reasons, and strike at my biggest fears for the bill - the corporate entities surrounding the music business will get all the money originally meant for the artists, and the radio entities that treat independent musicians fairly will be hurt by this piece of legislation. As with so many bills before Congress, you have to start to wonder just which ones are well-meaning but got corrupted along the way, and which ones have ulterior motives from the start. It seems pretty hard to find legislation that's 100% pure of intent. At this point, I'm on the fence about the PRA.